Battery life is very important parameter when considering Notebook Computers. So, if can measure battery life of your Laptop, you can manage your work using Laptop when the power is not available. 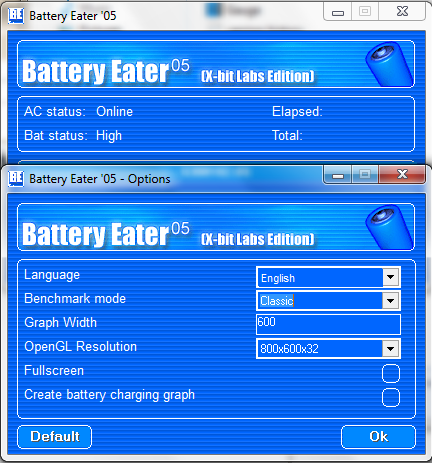 Battery Eater is a smart utility which can measures battery life of your Laptop. 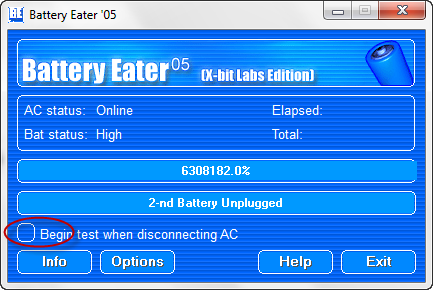 While testing, it heavily loads CPU,HDD , Video Card and RAM Also, Battery Eater is a free software. This application also shows AC status, battery name,type and manufacture. Now, let us try to run this program, when you run it, you will see the window like above image. Put a tick on Begin test when disconnecting AC . Go to the Option by clicking on Option button. In the options windows under the Benchmark mode there are three options called Classic, Reader's Test, idle and plugin Bench. Therefore, you can test your Laptop's battery with those options. Now, unplug the AC power from your laptop then it will automatically open the below window. While open this window, this will check your battery. If your battery is in bad condition, your Laptop will automatically turn off after several minutes during this checking. Also, this program will save a image of a graph of battery discharge. It makes a folder within under the directory of the Battery Eater Pro, this folder contains the graph of battery discharge. This graph will like the below figure. things or advice. Maybe you could write next articles referring to this article. Hey there! This post couldn't be written any better! Reading this post reminds me of my old room mate! He always kept talking about this. I will forward this article to him. Fairly certain he will have a good read. Thank you for sharing! also create comment due to this good post. and on the web I found this site as a finest website for newest updates. getting knowledge every day by reading thes pleasant articles or reviews. You are so awesome! I don't believe I have read through anything like that before. So nice to discover someone with some genuine thoughts on this subject. Seriously.. thanks for starting this up. This website is one thing that is needed on the internet, someone with a bit of originality! I'm gone to say to my little brother, that he should also pay a quick visit this web site on regular basis to obtain updated from most up-to-date information. It's genuinely very complicated in this busy life to listen news on Television, thus I simply use web for that reason, and obtain the latest information. however this paragraph provides nice understanding yet. Hey There. I found your weblog using msn. This is a very neatly written article. I'll be sure to bookmark it and come back to read extra of your useful information. Thanks for the post. I will definitely return. Article writing is also a fun, if you be familiar with afterward you can write otherwise it is complex to write. quick shout out and say I genuinely enjoy reading your articles. Thanks for finally talking about > "Measure the battery life of your Notebook Computer with Battery Eater Pro" < Loved it! I believe this is among the most vital info for me.